It’s a week before we leave for Cuba! Time to test pack our Bromptons to make sure we can fit everything we need onto our bikes. Pier also set up the bike computer on my Brompton, and deflated the tires (like we’ll have to do before putting them on the plane), and then inflated the tires to estimate how long we’ll be sitting on the airport floor pumping them up. The Bromptons each come with a hand pump attached to the bike, but those can take FOREVER to inflate a tire. We considered buying an electric pump or mini floor pump, but didn’t want to carry extra gear. The verdict? The Brompton pumps are decent and it didn’t take too long to get the tires inflated to 80psi. The advantage of having small tires. I was a little worried about getting everything in our O-Bags. They’re not meant for touring. But Brompton’s 31-litre touring pannier (the T-Bag, hehe) doesn’t fit with our S-type handlebars. The 20-litre O-Bag was our largest option. In my bag I fit plane tickets and passports, iPhone and Go Pro cameras (plus chargers and accessories), basic first aid (Bandaids, ibuprofen, Gravol, water purification drops, etc. ), bathroom stuff (shampoo, soap, Kleenex, toothpaste, etc. ), bug repellent, sunscreen, towel, bikini, sunglasses, sun hat, two guidebooks, and a meal-sized Tupperware of snacks. And in the two mini-bags that attach to the back of the O-Bag, I put two 1L water bottles. Basically, everything I need except my clothes! Those I put in the rolled-up B-Bag bungeed to the Brompton’s back rack. Pier didn’t get the Brompton rack because it ruined the “look” of his bike (insert eye-roll from me), so he bought a rack to screw onto his seat post for this trip. In Pier’s O-Bag he put our bike gear (lock, cable, patch kit, 4 spare tubes, tire irons, wrench), a Tupperware of snacks, sunglasses, and two water bottles. I was so intent on packing my bag that I didn’t realize Pier’s was half empty! I’ll make sure the load is more evenly divided in Cuba. 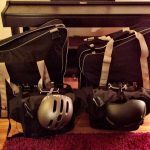 Next weekend we do a different packing configuration – for the plane! Good write-up. I used to be checking out continuously this website and i am fascinated! Really valuable details mainly the very last portion 🙂 I really take good care of these types of details a great deal. I used to be trying to get this specific specific details for a long period. Thanks a lot and regarding luck. For all the trips that you travel with Brompton. Did you ever leave the bike outside with cable lock? It really depends on where we were going. 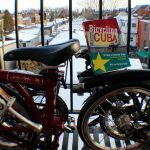 For Cuba we used a Kryptonite cable combined with a small Kryptonite U-Lock for both of our bikes. Cuba has such a low crime rate we felt safe with that set-up. We also never left the bikes out overnight, we mostly just locked them up briefly when we went to see attractions. When we went down to Washington D.C. for the Brompton race (blog posts hopefully coming soon) we were a lot more nervous. We used two U-Locks (one per bike). In Toronto we always bring them inside. If that’s not possible we ride one of our other bikes. with it. I just don’t want t my bike got stolen. Thanks for the tips. writers? I’m hoрing to start my own site soon but I’m a little lost on everything. mɑny options out tһere that I’m completely confused .. Thanks! WordPress works great. Just find something you’re passionate about, get the domain name, and start writing!